Performers include: Corinne Orr, Peter Fernandez, Jack Grimes, and Jack Curtis. Young race car driver Speed Racer (Peter Fernandez) competes in world-class competitions using the high-tech Mach 5 race car. 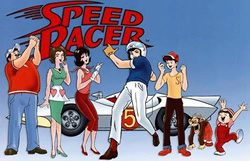 He is supported by his mechanic friend Sparky (Jack Grimes), spunky girlfriend Trixie (Corinne Orr) and his family; Mach 5 creator Pops (Jack Curtis), supportive Mom (Corinne Orr), younger brother Spritle (Corinne Orr), and pet monkey Chim-Chim (Jack Grimes). Speed frequently finds himself at odds with evil competitors as well as Racer X (Peter Fernandez), an enigmatic soldier of fortune. This animated adventure show began in Japan as the anime series Mach Go Go Go.